I found this book at a California laundromat last winter. 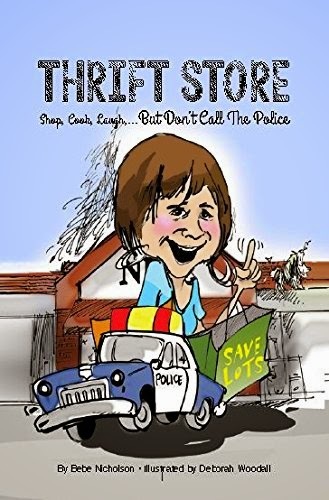 The full title is actually Thrift Store: Shop, Cook, Laugh...But Don't Call the Police. At first glance, it looks like a goofy, funny "ha-ha" book, which is why I picked it up in the first place. While it only took me about an hour to read, it was exactly what I needed after finishing other intense reading. Thrift Store is mainly a collection of anecdotes and recipes compiled by workers and volunteers for North Fulton Community Charities (NFCC) based out of Georgia. Each story is about a real experience that took place at a community thrift store, and is decently entertaining if you shop frequently at thrift stores. Most of the stories are cute and wholesome, and shed light on how non-profit thrift stores are able to help real people in need behind the scenes. The recipes scattered throughout this book are pretty basic, and you could really do without them or find billions of their variations on the Internet. The stories aren't hilarious in a belly-hurt kind of way, but they're simply just wholesome. That seems to be the best word I can use to sum up Thrift Store. If you're looking to gain tips and tricks about thrift-store deals and shopping, you probably won't find much in this book. But the stories do serve as a great reminder that certain things you may take for granted can end up making a world of difference to people in times of need. I've been there, maybe you've been there, but either way, this book is a nice reminder. Would you love Thrift Store? Reading Thrift Store could be a great way to spend an hour if you're at the DMV or at the park and need a happy pick-me-up, but I probably wouldn't recommend going out of your way to purchase it unless maybe you work at a thrift store. Either way, I've got to hand it to Nicholson and NFCC for taking the time to share their inspiring stories with the rest of the world.